According to the University of Maryland, tea is consumed by hundreds of millions of people around the world; only water is imbibed more frequently. There are three main varieties of tea -- green, black and oolong -- and all are made from the leaves of the Camellia sinensis plant. Of the three, green tea contains the most antioxidants, called catechins. Antioxidants help neutralize the effects of free radicals, which are atoms formed in your body as a result of pollution or toxins like cigarette smoke and that can damage cells. Fresh tea leaves are steamed and then dried to produce the familiar green tea shreds we use in tea bags or loose. Because green tea is made from unfermented tea leaves -- black tea is fermented and oolong is partially fermented -- green tea contains more antioxidants than black or oolong, according to an article in the April 2006 "Journal of the American College of Nutrition." It also contains less caffeine than fermented teas. Green tea extract is also available in supplement form. However, if you plan to use green tea, either brewed or supplements, for health improvement, you should consult your doctor before beginning. Naturally-occurring caffeine in tea is removed by any of four decaffeination processes. Two use the chemical solvents ethyl acetate and methylene chloride, one uses carbon dioxide and one uses water. None of these result in tea that is totally caffeine free; by law, a label that displays "decaffeinated" must have at least 97 percent of the caffeine removed. The decaffeination process using ethylene chloride was once considered to have carcinogenic properties and was banned in the United States. But according to the May 2004 "Berkley Wellness Letter," after further study, the FDA approved it for use. These decaf processes remove some of the antioxidants. Flavonols, one type of polyphenol antioxidant, decreased markedly after decaffeination, according to one study reported in the journal "Nutrition and Cancer." Researchers found that flavonal content varied from 21.2 to 103.2 milligram per gram for regular teas and from 4.6 to 39.0 milligram per gram for decaffeinated teas. Total flavonol content in decaffeinated teas was about half that of regular tea. In another study reported by Z.Y. Wang, et al., in the July 1994 issue of "Cancer Research," decaf tea was shown to be less effective than caffeinated tea at inhibiting skin tumors in mice. 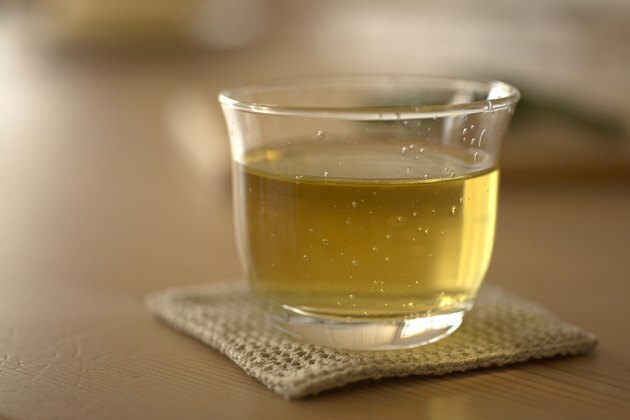 If you can tolerate caffeine, regular green tea is your best bet for antioxidant consumption. If you must choose the decaf version, try to find one that is decaffeinated by the carbon dioxide method. Dr. Pujari notes that if the package doesn't say, find out by calling the manufacturer. University of California at Berkley; Wellness Letter; Is It True What They Say About Decaf? Nutrition and Cancer; Catechin Content of 18 Teas and a Green Tea Extract Supplement Correlates With the Antioxidant Capacity; S.M. Henning, et al. The Seattle Times; Green Tea and The Breast-Cancer Connection; Astrid Pujari, M.D. Cancer Research; Inhibitory Effects of Black Tea, Green Tea, Decaffeinated Black Tea, and Decaffeinated Green Tea on Ultraviolet B Light-induced Skin Carcinogenesis in 7,12-dimethylbenz[a]anthracene-Initiated SKH-1 Mice. Wang Z.Y., et al. Journal of the American College of Nutrition; Beneficial Effects of Green Tea -- A Review; C. Cabrera, et al.